Natura 2000 sites were designated in 2004 and expanded by the amended Decree on special protection areas (Natura 2000 areas) in 2016 in accordance with the conclusions of a bilateral meeting with the European Commission in June 2014. They cover 7684 km2, which represents 37.9% of the Slovenian territory. Natura 2000 sites form a constituent part of ecologically important areas (EIA), i.e. areas of significant habitat types, parts thereof or larger ecosystem units that significantly contribute to the preservation of biodiversity. Ecologically important areas occupy 54.26% of the Republic of Slovenia. This indicator shows the Natura 2000 network, presenting the areas most suitable for preservation or achievement of a favourable state of species and habitats in the EU and Slovenia's interests. Protection measures and measures for modified use of natural assets are to be carried out in these areas. Natura 2000 sites (the EU's ecological network) were designated by the Decree on special protection areas (Natura 2000 areas), Official gazette of the RS, Nos. 49/04, 110/04, 59/07. 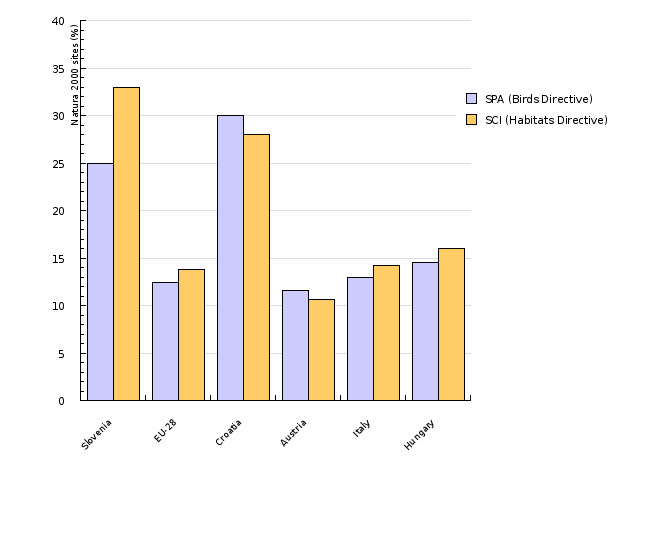 Sites of Community Interest (SCI) were defined on the basis of the Habitats Directive (Council Directive 92/43/EEC) and Special Protection Areas (SPA) have been designated on the basis of the Birds Directive (Council Directive 79/409/EEC). SPA and SCI areas partially overlap. 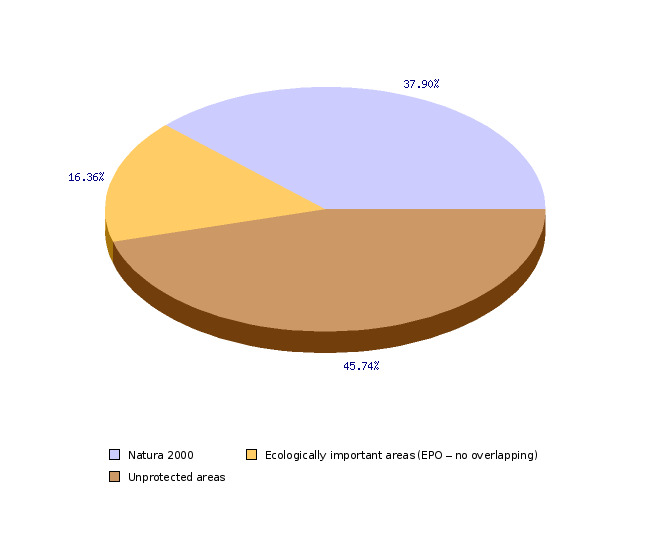 Register of Natura 2000 areas, Environmental Agency of the Republic of Slovenia, 2008, Natura 2000 Barometer, European Topic Centre for Biodiversity, 2008. Register of Natura 2000 areas, Environmental Agency of the Republic of Slovenia, 2008, Register of ecologically important areas, Environmental Agency of the Republic of Slovenia, 2005. To preserve a favourable state of plant and animal species, their habitats and habitat types. Joining the EU meant that Slovenia is now obliged to designate and maintain Natura 2000 sites, which occupy slightly more than 7,202 km2 or 35.5% of the Slovenian territory. The proposed list of sites (Sites of Community Interest – SCI), which Slovenia has drawn up by means of a governmental decree on the basis of the Habitats Directive, was adopted by the European Commission in accordance with a special procedure, which took a number of years. Negotiations with the European Commission commenced with two biogeographical seminars, namely one for the Alpine region, held in May 2005, and one for the continental region, held in April 2006. Based on the conclusions of both seminars, Slovenia supplemented the list of sites in April 2013 by way of amending the decree. Based on the Birds Directive, the decree also designates Special Protection Areas (SPA), which are significant for preserving or achieving a favourable state of bird species. After reviewing the results of negotiations, the European Commission found that Slovenia had not designated a sufficient number of areas, both in terms of number and extent. Therefore, additional “SPA add-ons,” which according to the European Commission, fulfil the conditions for Special Protection Areas, were designated by means of an amendment to the decree in May 2008. In June 2014, at a bilateral meeting (biogeographical seminar), the European Commission verified the fulfilment of obligations under the Habitats Directive regarding the designation of Natura 2000 sites in Slovenia. The conclusions showed a considerable improvement, along with a few deficiencies, which Slovenia eliminated by way of amending the decree in March 2016. About 70% of the Slovenian Natura 2000 network is covered by forests, which suggests their generally good state of preservation. Almost 5% of Natura 2000 surface area is located above the tree line. Lowland floodplain forests that were heavily deforested in the past are not in a favourable state of preservation and are additionally protected through the network. Out of all non-forest areas, the Natura 2000 network comprises ca. 20% of utilised agricultural land, the most important thereof being extensively managed meadows. In several areas, the meadows are still in a favourable state of preservation, though pressures that are decreasing their favourable state are great and include both regrowth of natural vegetation due to the abandonment of farming, as well as intensification of meadows management. The Natura 2000 network also specifically protects caves (in 67 out of 324 areas). Inland waters represent only slightly over one per cent of the network, yet they are of great importance for its preservation. Several waters are nevertheless not in the most favourable state of preservation. Human dwellings are of significance for reproduction, resting or wintering of certain species, making certain built-up areas vital in the Natura 2000 network. The species in question are mainly birds (for example, the white stork, the European scops owl) and mammals (such as bats). Ecologically important areas were designated by the Decree on ecologically important areas in 2004, which was amended in 2013. These are areas of significant habitat types, parts thereof or larger ecosystem units that greatly contribute to the preservation of biodiversity. Certain protection guidelines and rules must be taken into consideration in spatial planning and the use of natural assets. However, natural protection consents or conditions for the construction of objects in ecologically important areas that are not Natura 2000 sites, protected areas or areas of high nature value are not required. Among ecologically important areas are the main habitats of large carnivores, the sea and the sea coast. Natura 2000 areas are an element of ecologically important areas. Data on Natura 2000 areas are managed in the database Register of Natura 2000 areas in the framework of registers of areas which are significant for maintaining biodiversity. The data are maintained by the Nature Conservation Sector of the Environmental Agency of the Republic of Slovenia on the basis of Article 34 of the Nature Conservation Act (NCA-OCT1, OG of the RS, No. 96/04) and Article 5 of the Decree on special protection areas (Natura 2000 areas) (OG of the RS, Nos. 49/04, 110/04, 59/07 and 43/08). As part of these records the Environmental Agency of the Republic of Slovenia also maintains the register of ecologically important areas on the basis of Article 4 of the Decree on ecologically important areas (OG of the RS, No. 48/04).